Transforming the old Marine Police Headquarters into Hullett House, an 11-room boutique hotel complete with five wining-and-dining outlets, was no mean feat. The project is a testament to what can be achieved when we decide to preserve our historical buildings. Occupying prime Tsim Sha Tsui real estate, the colonial gem has being painstakingly restored and converted by David Yeo and his team from Aqua Group. First to open is stunning tea room/all-day restaurant The Parlour. 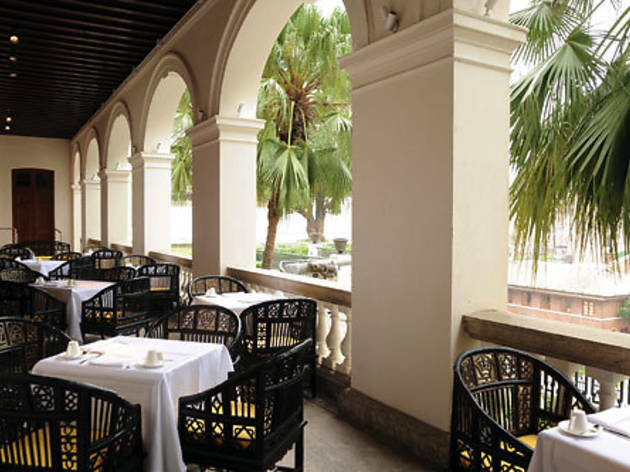 The early-colonial-Hong Kong-themed bar and dining rooms (there are three in total) open to a grand outdoor balcony complete with replica Qing Dynasty chairs and a view of our windowless Cultural Centre. The interior design is beautifully done, with meticulous attention to Old World details. But that is what Yeo is known for, with past projects including Hutong, Aqua Tokyo/Roma, and Yun Fu. All are fanciful, design-heavy restaurants offering solid if unspectacular food, and it’s a track record the team may well be able to improve upon with The Parlour. The environment alone – the aged wall murals of Hong Kong’s harbour in the early 1900s, the black-lacquered bar, the elevated views of Heritage 1881’s promenade – provides ample illustration of the lengths to which the team has gone to provide a wonderful dining experience. The staff seem genuinely happy to see you, and are enthusiastic about introducing the restaurant’s features. The wait staff get a nod for their knowledge of the brand new menu. We asked a lot of questions, with never a “Hang on, let me ask the kitchen” in response. Our waiters were also quick to make recommendations, and shared highlights of the chef’s CV as a side note. A sense of pride was clearly evident. 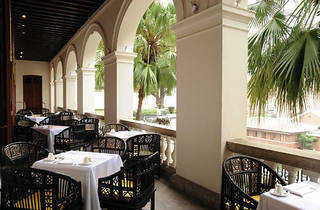 The brasserie-style food is focused, with few compromises to suit local palates. True to its French-and-English brief, the menu features croque monsieurs, lobster bisques, and afternoon tea sets. After several visits, here are our top picks. Start with the chilled pinky – a fruit soup made from tomato, watermelon and honey dew ($80). Sweet, refreshing and low cal, this is a food of the gods for dieters. Assuming you are now ready for something more robust, you can’t go wrong with the chicken Caesar salad ($140). In this, our waiter supported our choice and dutifully noted, “This is not like other chicken Caesars you’ve had. This salad comes warm.” The still-warm, grilled chicken breast duly arrived, served on a bed of romaine with sautéed fingerling potatoes, smoked bacon and a heavy anchovy dressing. If you like big flavours, you’ve come to the right place. The textures were also a winner, the lettuce staying crunchy under the heat of the tender, skin-on chicken and hot dressing. Chicken Caesar may seem an unremarkable item to order from the menu. Not so, since despite grand appearances, The Parlour also manages to fit the role of a casual spot to have tea and read the newspaper. You could of course have a five-course meal here; but equally, you could come for just a sandwich and some iced tea. We did just that one sunny Sunday – stopping by for a Hullett Club sandwich ($140) and the afternoon tea set. The afternoon tea set ($178) is a multi-tiered savoury-to-sweet experience. Finger sandwiches of curried ham, egg salad, and smoked salmon are crustless, on fluffy white bread. Crumbly, palm-sized scones (with clotted cream and jam) top the tiers. In other words, just what you would expect from a first-class tea set. But it was the desserts that tickled us most. An assortment of chocolate mousse cakes, fruit tarts, and one-bite pastries were presented like jewels on a plate. As we were admiring the presentation, our waiter informed us that the pastry chef was formerly of The Dorchester in London. It seems David Yeo is really taking his food seriously. In the end, the strawberry cheesecake left us laughing. “What does that feel like on the tongue?” my dining companion asked. I slipped the heart-shaped cake on my mouth and tasted sweet strawberry jam. The texture was soft, almost wet. “Like a tongue in the mouth, isn’t it?” Yeah, it was sort of like that. And the romance of this new eatery, with its colonial style and food, was best summarized as such: a wet kiss.